If you are looking for a conference venue away from the hassles of the city, we're the perfect place. 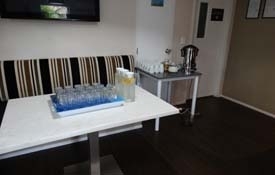 We are Whangamata's only conference venue located just minutes from the beach, local restaurants and shops. We can provide the environment for a conference, workshop or training group that achieves results. Catering is easily organised by us, in-house, to your requirements and for after we have a well-stocked bar and café. If you want we can organise fishing trips, mountain biking, surfing, kayaking, or any number of activities here. No matter what you need we're here to help make it happen. Amenities include flipcharts, whiteboard, projector screen and data projector. We are also more than happy to help organise anything else you might need. Found out more about our conference facilities here. Book your conference room today!